Weeds provide a natural healing remedy for areas in the ground that are damaged, malnourished, and don’t have the capacity to grow certain types of plants. Consider weeds to be seat fillers and your garden is a high-profile televised event. 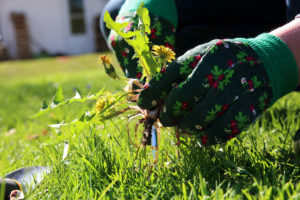 Much to every gardener’s dismay, weeds are also considered a pest in the lawncare industry because they absorb vital minerals and nutrients that other plants need to survive—and they’re relentless, hence the saying “growing like a weed”. For your benefit and sanity this spring, here are the top five weed control tips to help you keep your garden aesthetically pleasing this spring. As every seasoned gardener knows, not all mulches are created equal. Some are completely organic, others are artificially formulated. And then there are the mulches that are a mixture of organic and artificial ingredients. Always keep in mind the region in which you live and the types of plants you have in your garden when choosing mulch. Your best bet is to consult a professional gardener or lawncare expert in your area before choosing mulch for your garden. A lot of people mistakenly think that the best way to permanently rid their gardens of weeds is by rooting them. Unfortunately, because weed seeds can easily be transported by breezes, under the soles of your shoes or even other plants, there really is no way of permanently removing weeds from your garden or preventing them from ever growing again. The best way to temporarily halt their growing cycles for as long as possible, though, is to chop off their heads and effectively cut off their nutrient supply. Herbicides tend to get a bad rap because many people believe that they’re bad for the environment. Organic herbicides actually don’t have that much of a negative impact on the environment. However, they do effectively kill weeds, but they need to be applied on a regular basis. Perennial weeds tend to return frequently, which means you’ll want to apply organic herbicides frequently to help keep your garden looking beautiful. Flaming weeds is probably one of the most fun forms of effective weed control, but it can also be dangerous. You can use a precision hand-held or backpack-style propane tank to incinerate the weeds in your garden. Adjustable temperature control settings and a thin pointed tube make it easy for you to aim the device at each weed, minimizing the risk of harming your other plants. For some gardeners, there’s nothing quite like getting down on your knees to pull and hoe the weeds out manually. While this isn’t always the most efficient way of doing things, it can certainly be cathartic to grasp onto the heads of the weeds, pull them out, and then discard them. Whichever form of weed control you prefer this spring, be sure to call on the garden and lawncare experts at FOREVER GREEN LAWN & LANDSCAPE INC. Our services include outdoor space beautification, maintenance, and installation. To learn more, please feel free to contact us today!